My first visit to El Nido three years back was with two reasons – to nurse my broken spirit after my mum’s demise and to fill the gap of our aborted Tubbataha 2010 plan. Discovering and diving in this quaint town was more than good enough, I came home with my light tan and twinkling eyes, that trip with my favorite dive buddy gave comfort somehow. And as if to console our selves as we left, he promised we will be back in five years and I was thinking if I would still be around after such time. Gladly, we were back not after five years but shortly, my buddy just gave in to my whims for a return this June, exactly three years from the first visit and what a joy! I was anticipating for a relaxing long weekend in this quiet town with sights like karst cliffs, mountains, greeneries, underwater life, beach and sunsets. The trip was challenged again – confusing changes of my airline tickets, the rains and my buddy’s late arrival in PP but we made it though. Last evening flight from CdeO, overnight in Cebu, flight to Puerto, five hours wait, six hours bus ride, then I finally hit my bed almost midnight in El Nido. It was like more than 24 hours on the road! Indeed, I was wishing for an unhurried pace during the get-away. We woke up the next morning with heavy downpour, the rains pounding the roof creating ground pools. Eager for our day’s dives I was hoping it would stop but refused to be bothered, I always considered rains as blessings. 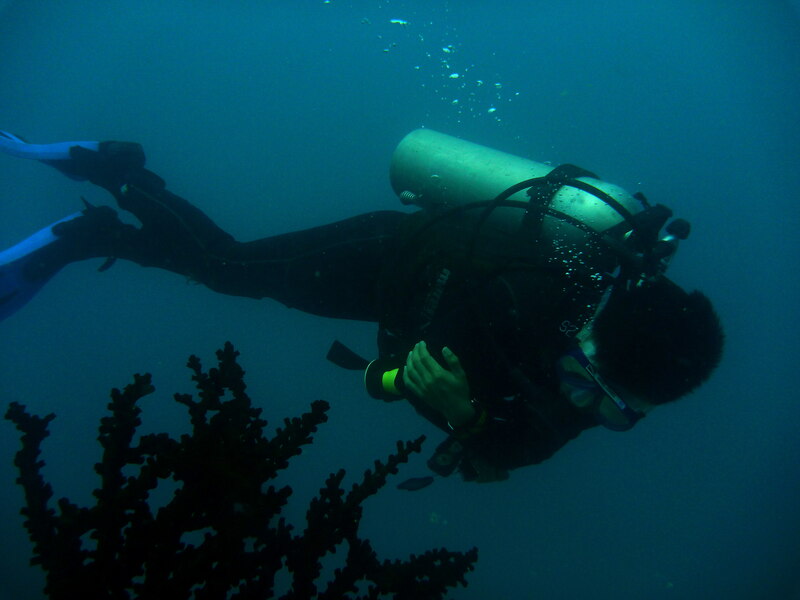 The downcast skies and showers did not prevent us in reporting to Palawan Divers at 8am as agreed. Accordingly the day’s dives were cancelled by management for safety reasons, inarguably it was logical and we trusted their judgment. Wish granted! So our day one was all about relaxing and food galore, yes literally we hopped in three restos for all our day meals.  So as a start we had breakfast at The Art Café (tuna pesto, bruschetta, fruit shakes), lingered for sometime in their breezy second floor terrace, leisurely playing sungka while having our meals. For lunch, we chose The Alternative Resto and tried mixed veggies soup and fish steak with mashed potatoes. 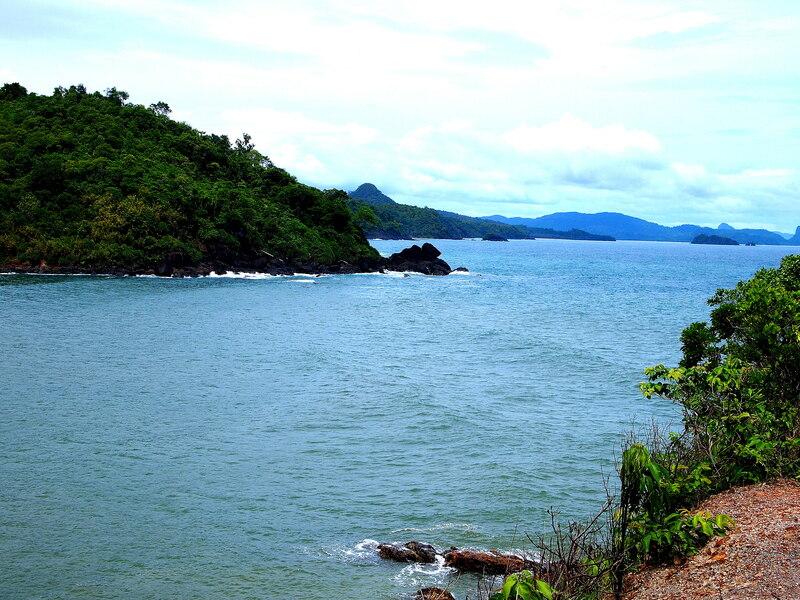 The place is at the waterfront overlooking Bacuit Bay and so we had a good view of the overcast horizons, it was an opportunity to sit by the seascape with such gloomy mode, and it was surprising that the surrounding waters was so calm. No sign whatsoever of disturbance. We got chance to walk around town on our way home, many changes were evident – lot of lodges, inns or hotels sprouted and so with restos, cafés, spas, bistros even new dive shops now lining the street. The down town is getting a bit crowded compared three years ago, though the bucolic atmosphere is still there. Funny was, we were in our wetsuits getting around – talking of properly dressed! Our afternoon nap compensated for the previous day long trip, and we had few hours to rest and unwind until evening. 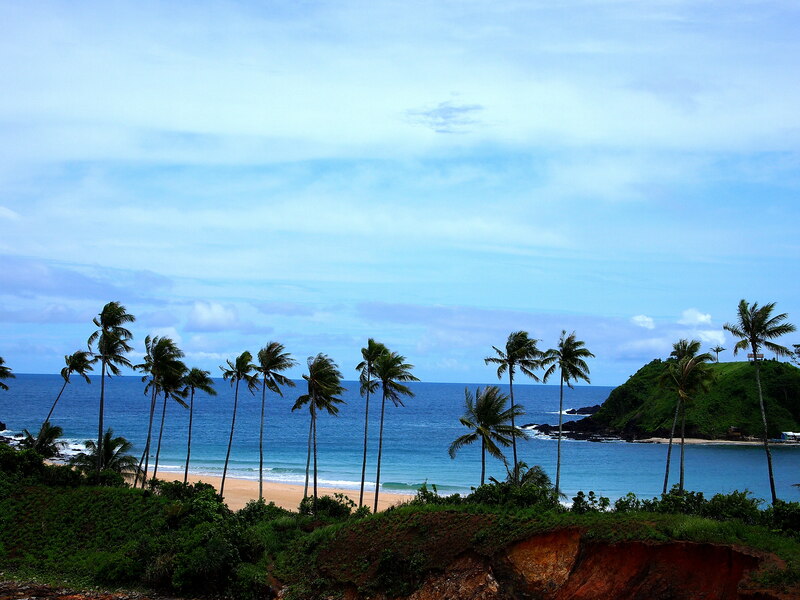 Blue skies, blue waters and serenity…. The gorgeous sunset that I wanted to view again by the bay was nowhere, downcast skies was all the way to the evening. But it didn’t stop us to walk the dark path to have our dinner at Bacuit Grill. 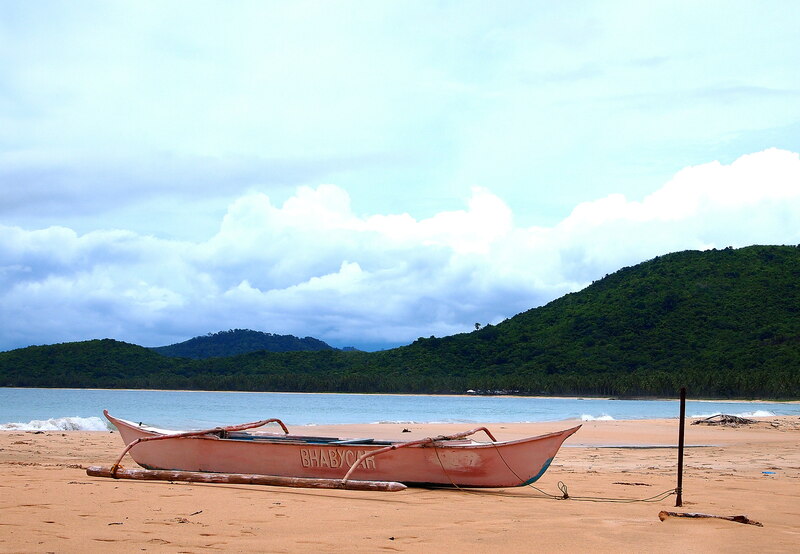 Hadefe Cottages is in Brgy Masagana at the far end of the shoreline quiet accessible to the resto. Angel and I both loved the place, it has lovely view of sunset and night lights lining the coast in the evening. Most importantly, the food is great – we both loved the creamy shrimp spaghetti! I was imagining I was in St. Tropez (again) sitting there watching the night lights under a canopy of stars. But there were no stars this time, and the rain started to pour again after we ordered our food – and yes, we had shrimp spaghetti again with veggies salad! Bacuit Grill I think is iconic in El Nido, it was filled with diners especially evenings foreigners or local tourists alike. Sometimes a simple wish is granted inscrutably, the poor weather turned the day as purely relaxing – easygoing and comfortably indulging us with good rest and good food. The next morning promised bright skies despite the light morning rain, we found already other divers when we got at the dive shop and again all were foreigners – all four of them: a couple doing intro diving, one doing confine dives for OW course and one with high-tech cam doing some documentary who was joined to us with DM Doy. It was a bunch and it felt good to be back. I was glad to see DM Yoshi again and reminded him of our dives with them three years ago – amazing three long dives one sunny day which he described as crazy! We cruised about 10 minutes to Cadlao Island – the largest island in Bacuit Bay and dropped off Ms. Abby with the OW student at Paradise Beach. We got back to the nearby Natnat Beach for our first descent unto a sandy slope decorated alternately with soft corals, crinoids and tropical fishes. Mysteriously the viz was not bad despite the previous day rains. 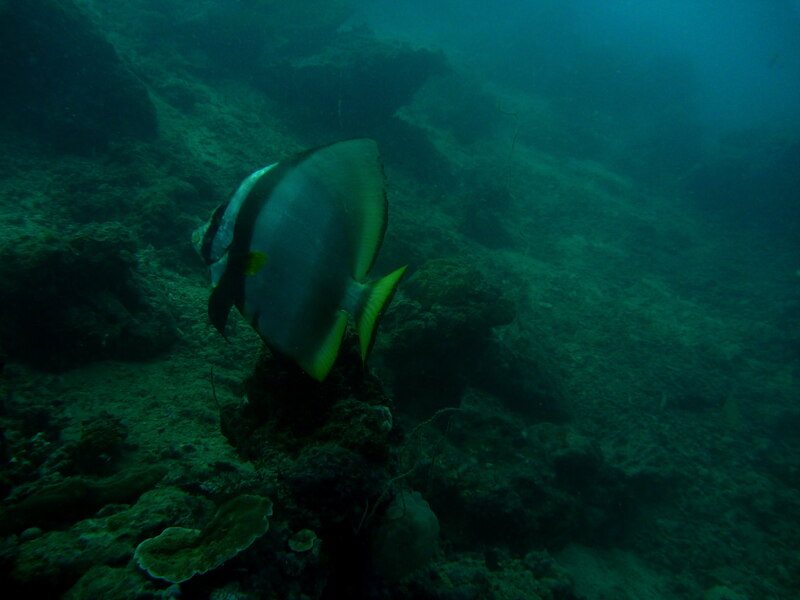 There were rabbit fishes, sergeants, clownfish, trumpetfish, trigger fish and a herd of striped eel fish. I tried to follow a giant bat fish that came near but was so elusive. 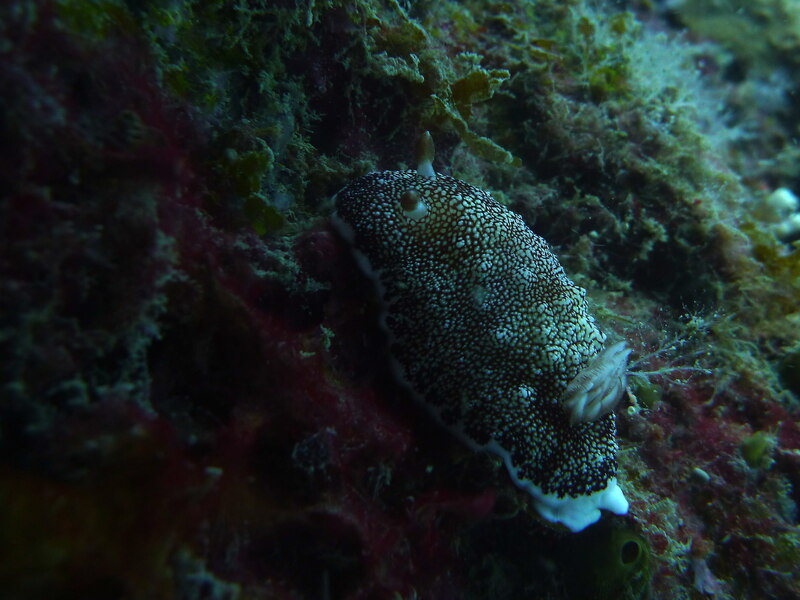 There were several specie of nudis and found some bristle worms too. We ascend after 56 mins with my air still at 100 bars. The sun was generous enough and brightened the skies for our dives. We proceed to Entalula Island as our next site and had our surface interval there. Our next descent was at the western side, DM Doy briefed us to go south bound halfway then swam back in same route for the boat. Rolling back for our entry we descend to a drop-off and drifted with the mild current. Tropical fishes hovered over soft and hard corals, there were damsels, puffer, triggers, trumpets and variety of anemone fishes. Then a blue spotted ribbontail ray resting on under sand crevice surprised us, but quickly hid from view disturbed by our quick movements. Our first time to spot such colorful ray, its radiant numerous blue spots and its flattened long tail with blue lines looked interesting. We found also a gray stingray resting on sand, quickly hopped nearby after our DM gently poked him. The stingrays for me were great find, absolutely. Our return to the boat meant swimming against the current which become stronger, such conditions made me cringe – swims against current are tiring! We hovered over a coral area for our safety stop, where a curious remora swam near us perhaps inspecting for a possible abode! We ascend after 50 minutes with my air at 100 bars. indeed calm and the afternoon waters welcomed us as we back rolled for our entry. 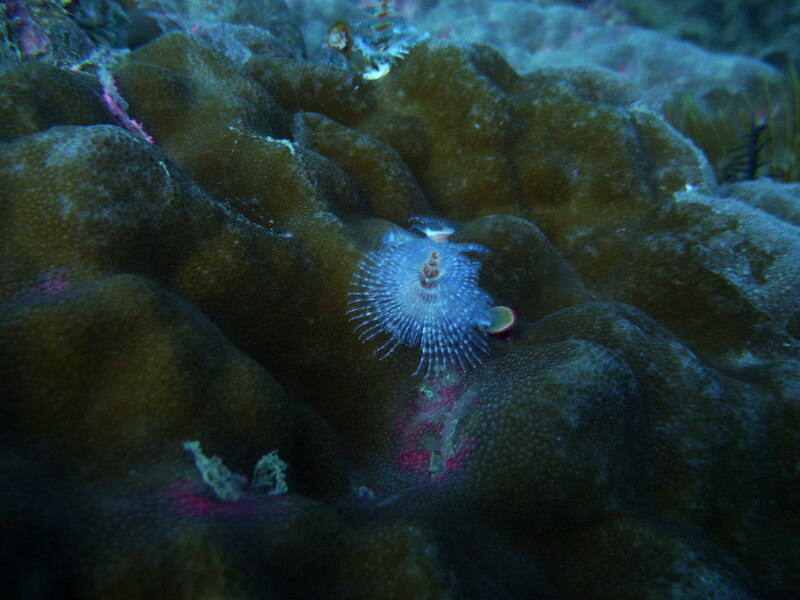 We ascend unto a reef slope with variety of tropical fishes, decorated with table corals, whips and sponges. We found two blue dotted stingray both resting on sands, it was surprising that they were not threatened of our presence, as they keep their grounds. 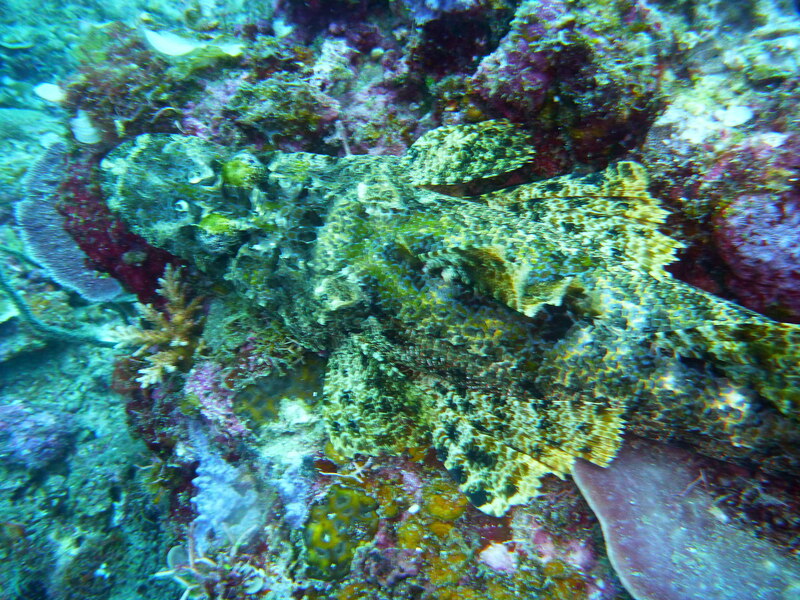 There were yellow scadfish, sweetlips, anemone fish, pipefish and puffers. We passed by a school of transparent barracudas – another great find! At first I thought they were different specie of jacks. One more great find was a crocodile flathead, as bottom dweller it was camouflaging on the sands, I thought it was a stonefish. We ascend after 52 minutes with my air at 90 bars. Well, we finished off the day with pasta dinner in Bacuit Grill – I guess Angel just love the place and their great food. Again, it was pouring hard while we dine but the aura of the bistro was cheerful – it was filled with tourists again. As if everyone was oblivious of the dark night and rains…. The next morning greeted us with bright skies which what we just wanted, one more day to relax and discover the twin beaches of Nacpan and Calitang! No rushing, we wanted our last day in our unhurried pace so we left the town by mid-morning taking Tolit’s motorcab. The first-half of the roads were paved and the rest were bumpy and pot-holed, there were ongoing road works leading to next town of New Ibajay. Just like back home, I think these on-going road works are all over the country. Watching the bukid sceneries is pure joy to me, the mountains, the fields – so serene and pure. The rice fields which I believe are rain-fed in different states – few were left from last harvest, some started to plow, few had seedlings sprouted already, few are ready to plant and some have started to plant already. And I am always amused of herons gathering near the carabao in the middle of the field, some even would hop on the carabao picking its back – two contrasting colors yet in harmony – white heron on black carabao’s back! We arrived Nacpan beach after an hour, the long stretch of long beach was almost deserted and the clear blue waters decorated with waves – like beckoning us! Such luxury when all those beaches out there are crowded and filled with man-made structures. The mild sun was a blessing though the sky wasn’t blue enough for the photos, the subdued sky over the horizon created an unobtrusive milieu. Angel and I found a new friend, a local dog just came over us while we’re taking refuge under the coconut trees, she lingered with us and even joined us as we tried to walk the long beach but have to get back when it started to drizzle. I remembered the pup that joined us in Daku Island. A pink boat in the beach! We started to walk the westward stretch, you can never miss the colossal resthouse on the beach which appeared ominous and hollow – a sharp contrast from the simple and ordinary abodes of the locals! We climbed the hill for a vantage of the two beaches – taking the higher grounds is the best way to get a good view of this extraordinary works of nature. We spotted few tourists taking photos on our way to the hill top, bit arduous and filled with tall grasses, I was wary of bee and insect stings. It was somewhat slippery due to rains. We got it to the top with the breathtaking view – extraordinaire indeed! The 360 degrees view of this little paradise was indeed soul-filling. 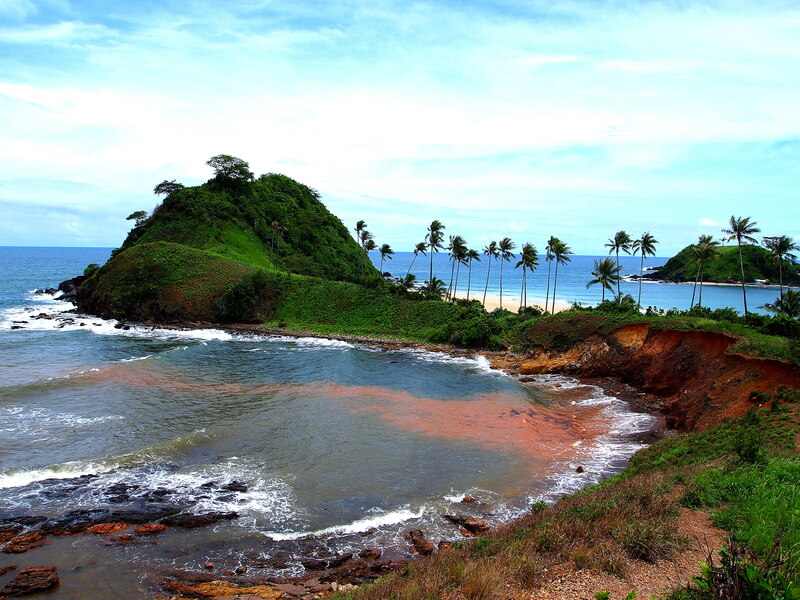 To swim in this beautiful beach is an act of worship! We finally left at 3pm passing again all the greeneries and fields, and got back to town in 45 minutes. Surprisingly shorter than going there, I think Tolits drove faster going home. We have enough time for some good rest before our long bus trip back to Puerto Princesa. 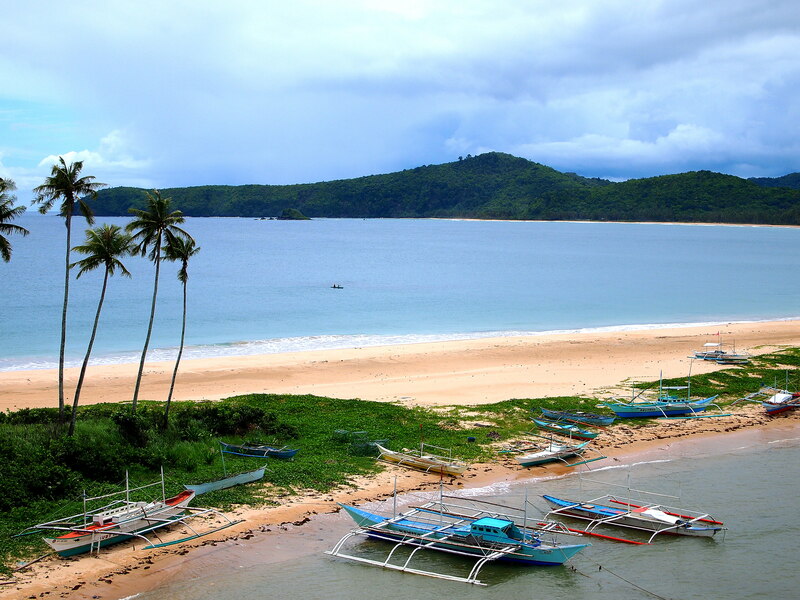 For the second time, coming to El Nido is an affair for relaxing and for new discoveries. And again I am always grateful of Angel’s company during these exclusive trips. Perhaps I will never get a chance to experience El Nido staying in Miniloc Island Resort, Lagen Island Resort or the latest addition and most luxurious, Pangulasian Island Resort but many would miss or often neglect the ordinary and simple things as opulent because it is not expensive and ostentatious. For me, the greatness of God always reveals itself in simple things, not rearranged by human hands. I may not be back to this quaint town again but I’m taking all these beautiful memories to heart. Yes, it’s another affair to remember. 1. There are lot of dive shops now in El Nido but I prefer Palawan Divers, we paid P 3,600.00 per head for three boat dives, including DM, BCD & reg, lunch and marine conservation fee. Enriched air would cost P 300.00/tank, certification is necessary. 2. Aside from vans, El Nido can be reached also by Roro aircon bus at P 425.00/pax; reservation is needed to get a sure seat especially if you have a flight to catch in Puerto Princesa. 3. Skin care essentials – sunscreen, tapis or hat. 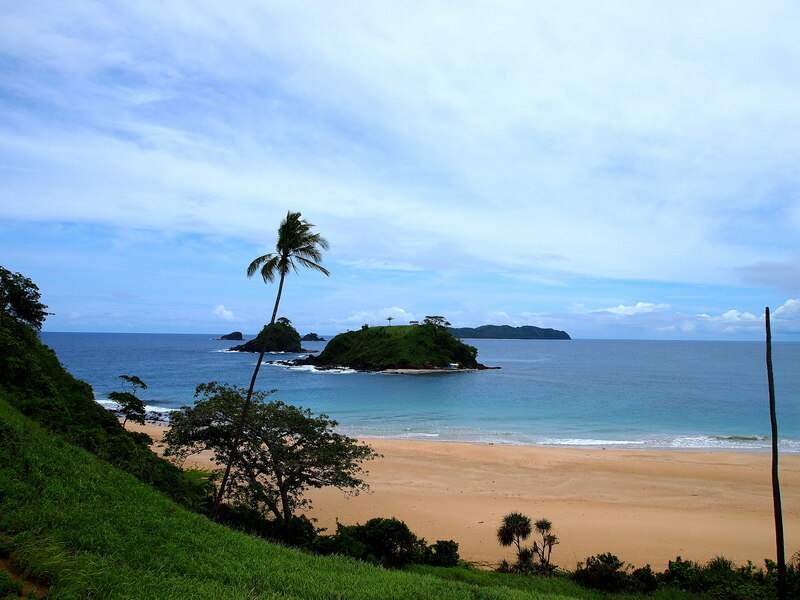 If you head for Nacpan, don’t forget insect repellent to protect from sand flies. I’m still suffering from bites allergies after four weeks!